I make tea-cup candles and sell them in our Blackwater Valley Veterinary Surgery, Camberley. I was inspired to get involved in fundraising for Cats Protection as our surgery has a great relationship with Cats Protection and I love cats so I was keen to get involved. I really enjoy spending time hunting down beautiful tea cups to fill with candles and it is immensely satisfying to be able to raise money for a worthy cause, I have raised £115 so far and I have plenty more tea cup candles to sell! I am a Veterinary Receptionist which I have been doing for 9 years. 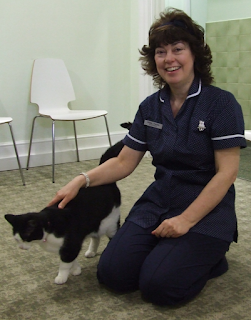 I am also a Feline Behaviour Advisor which I have been doing since taking my qualifications 6 years ago. Being a Cat Behaviour Advisor is really challenging but also very rewarding. Some of the common behaviours I see are inappropriate soiling, over-grooming and aggression. Working with cats and owners can be time-consuming and complicated but I love what I do! I have had cats all my life and I currently have two cats. Musette is a very nervous girl who is not too keen on men. Marmaduke was a rescue cat and is completely mad! I knew as soon as I got my first cat at 8 years old that I loved them. His name was Smokey and we had a very special bond. Some years later he disappeared and I am still sad that I never knew what happened to him. I would sleep and dream of eating Dreamies! I love meeting people, I have always had careers which involved working with the public. I used to work in banking and I saw that as my career but now, I am loving my job which feels like a vocation. The second fact is that I love cats! Cats Protection Camberley & District would like to thank both Debbie and Chief Vet at Blackwater Valley Vets, Djordge Vuckovic, for all of their support. Not only does Djordge allow Debbie to display her lovely teacups in the waiting room, he also supports Cats Protection by caring for, and providing veterinary support for, many of the cats in our care.